I have always been fascinated by the phrase “Setting up shop”. There have been so many people who I have talked with that use this phrase when launching their business, even those starting non-retail businesses. The excitement of offering their unique services or product mix is just like opening a store for the very first time. So much to do like arranging all the areas for products to be displayed, stacking the packaging and even the adding your business colors to the decor. Yes it’s their shop, their business. Unfortunately this feeling of having a new shop lasts for just a few weeks or so and soon the day-to-day operations of management settle in and they find themselves deep into micro managing the business. Somehow the illusion or vision of the little shop fades to the daily tasks of paperwork and phone calls. There still is power in that vision of setting up shop and launching a new business. A lot of excitement, inspiration and creativity were flowing before you opened. You were in the “Flow” of thinking. It is important to be able to revisit that visual process to maintain relevance in the market. Why? Because visualizing a business from a fresh perspective is a critical and creative process for seeing through the eyes of a consumer for any business. Here’s a creative thinking exercise that you can try. It involves thinking, not outside the box, rather inside the box or at least inside a different box. When we attempt to brainstorm and think outside the box freely, we lack true focus and some thoughts soon tend to wander or get misdirected because of outside stimuli or distractions. So there is an exercise to help us maintain flow. This exercise has work very successfully in business ideation session where business owners can visualize their business from a fresh perspective. Step 1: With blank paper, pen, ink and 15 minutes on the clock, only 15 minutes, think about your business visually. See all the things you offer, your branding images, colors and even how you do business. Stay focused on your business. Step 2: Start the clock now! 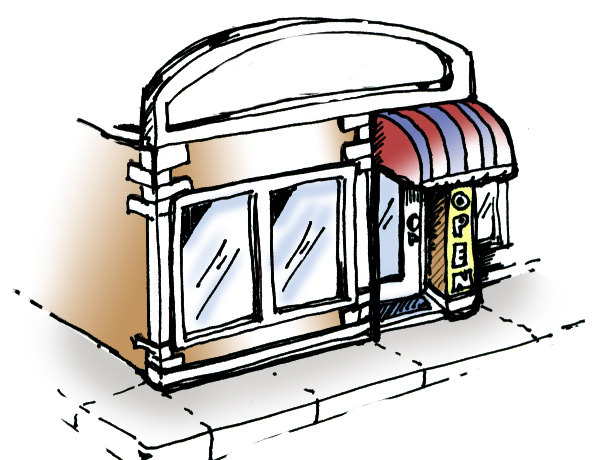 Think about which retail business you would see your business as if it were a retail business. Not who you want it to be like, but who you see yourself as today. Be honest you’re yourself or this is all for not. Would it be a big box store, national retail chain or a Ma and Pa shop? Think about every detail and compare your business to a retailer. When you have it, write it down at the top of the sheet. Step 3: With the clock still racing, write down single word attributes of the retailer of choice. At least try to get 5 – 9 clear attributes. If you get more, you can scratch off the ones that are too generic. “Ding” please put all pens down your done. Turn you sheet over or under something to avoid looking at it again until this exercise is done. Okay, you now have a visualized snap shot of a retail shop or store that you closely associate your with your business. Great, but your task is not completed. You have two more steps to go. Yes, it’s a triad thing. Step 5: Again, start the clock and this time imagine your business as the retailer you would like it to be like. See the store or shop in visual detail. See how the staff interacts with customers, products displayed and the look of the space. Select one retailer that you want to be like and write it down. Time is ticking. Step 6: Now write down the attributes of this retailer. As many as possible and refine to 5 – 9 again. “Ding” please put all pens down your done. Wow, that was a bit tougher. If you did it in 15 minutes, which you were suppose to, then you get a gold star, but your task is about to get tough. Step 7: A new sheet of paper. Place 30 minutes on the clock. This time, place the first retailer sheet to the left of the new blank sheet and the last exercise sheet to the right. You have in front of you is a vision of yourself today to the left, how you see yourself in the future to the right. Look at the attributes of both retailers. See the similarities and the differences. On the middle sheet you will focus on those attributes that are different and quickly give answers to this question for each attribute change. Example: if the first attribute was intimate you might have mass appeal as a difference on the other sheet. Step 9: “Bing” Done, at least with this exercise. What did you discover about your business? How much easier can you redirect that you have a visual reference? Visualizing parallel conditions such as seeing ourselves as another business type, allows us to drop some of our defenses and preconceptions to explore new options and possibilities. Creating role models can aid in maintaining the focus, direction and purpose of brainstorming. Unlike traditional process of free-form brainstorming, using exercises with visual models helps create tangible call to action for change. I hope this exercise can help you when you have that desire to take your offering to the next level.